Kanazawa is a relatively compact city with several different districts, each with its own character and attractions. Here, I’ll introduce the main districts in Kanazawa and their top sights. Kanazawa Station Area: The main train station, big hotels and plenty of restaurants. Omicho Market Area: A fantastic food market and many restaurants. Kanazawa Castle/Kenroku-en/Museum Area: The main attractions are all in or near this green core. 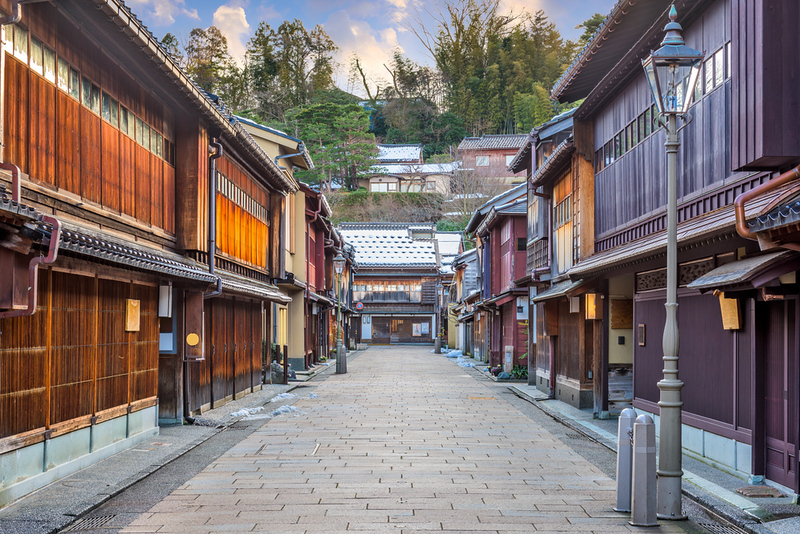 Higashi Chaya Area: Beautiful preserved streets and houses. Korinbo Area: The main shopping, dining and nightlife district. Nagamachi Samurai House Area: Beautiful old samurai houses. Teramachi Temple Area: A cluster of Buddhist temples. Kanazawa is a relatively compact city and most of the important sights are within walking distance of the station. However, it can be tiring to try to visit them all on foot. For details on how to get around Kanazawa, see the Getting Around Kanazawa page. This is where you’ll arrive in Kanazawa. JR Kanazawa Station is the center of this district. You’ll find plenty of shops and restaurants in the station building, as well as the main tourist information center. Right outside the station (on both sides), you’ll find the city’s biggest hotels. You’ll also find the Kanazawa Forus Building, which has a great collection of restaurants on the 6th floor. There aren’t any major sights in this area. A 15-minute walk southwest of the station brings you to Omicho Market, a fantastic food market that is like a mini Tsukiji. It’s a great place to explore on your way to Kanazawa Castle or Kenroku-en Garden (see following). There are plenty of restaurants in and around the market. Why not sample some of the area’s fantastic seafood for brunch? Kanazawa is built around a green hilltop district that is composed of Kanazawa Castle Park and Kenroku-en Garden, two of the city’s main sights. This green core is about 10 minutes’ walk southwest from Omicho Market. Tucked along the southwest side of Kenroku-en, you’ll find the city’s museum district, which is home to the Kanazawa Prefectural Museum of Art and the 21st Century Museum of Contemporary Art. Slightly south of these two major attractions you’ll find the sublime D.T. Suzuki Museum. About 15 minutes’ walk east of Omicho Market is the Higashi Chaya Area. This was the city’s traditional entertainment district and it is home to some beautifully preserved geisha houses (confusingly known as tea houses). This is a great place to wander and soak up the “Old Japan” atmosphere. Just across the river, you’ll find the Kazuemachi Chaya Area, which is similar but much less crowded. About 20 minutes’ walk south of Omicho Market is the Korinbo Area, which is the city’s main shopping, dining and entertainment area. It’s packed with restaurants, shops and bars. There are also a few hotels scattered about. Just west of Korinbo is a small neighborhood of preserved samurai houses known as the Nagamachi Samurai House Area. This area consists of two canal-side streets lined with lovely preserved houses and a few scenic cross-streets. There are some good cafes and restaurants here. Just across the Sai-gawa River from Korinbo, you’ll find the Teramachi Temple Area, a compact neighborhood packed with small Buddhist temples. It’s not the most exciting area in town, but it’s worth a stroll if you’re in town for two or more days.